Industrial refrigeration systems consist of several major units (compressor, condenser, and evaporator) connected together with pipe and tubing and filled with refrigerant. To get the right overall result, these individual components must not only work, they must work together in just the right way. Refrigeration controls are what make that happen. Just as the conductor of a symphony orchestra makes sure that all the individual musicians coordinate their playing, refrigeration controls make sure that all the working parts of a refrigeration system coordinate their functioning. The primary controls in most refrigeration systems are the thermostat, which attempts to maintain a constant temperature in the refrigerated space, and the thermostatic expansion valve or TXV which automatically adjusts refrigerant flow in response to refrigeration load. There are also secondary controls which, in some systems, ensure that other important activities are carried out properly. Examples are defrost control and head pressure control. Some refrigeration systems are designed to freeze product and/or keep it frozen. Others are designed to cool product and/or keep it cold — but definitely not freeze it. Thermostats allow refrigeration systems to bring product down to a predetermined temperature, but no lower than that temperature. Some refrigeration thermostats are similar to room thermostats in that they use a bimetallic strip to sense temperature. Others use a remote bulb filled with mercury or some volatile liquid. Still others sense temperature electronically. Thermostats don’t often fail completely, but their internal calibration sometimes changes, and other factors can affect their accuracy. Thus, it is not safe to assume that the temperature indicated on the thermostat dial is the actual temperature in the refrigerated space. An accurate thermometer should be used to monitor space temperature. 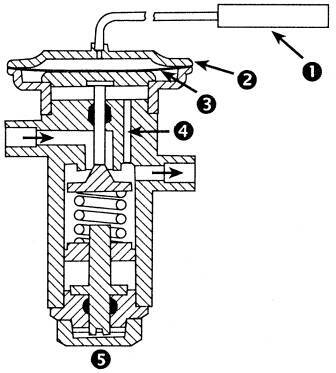 Illustrated below is a typical thermostatic expansion valve. A TXV does two things. First, it acts as an expansion device for the refrigerant. That is, it allows the liquid refrigerant to move from the warm, high-pressure environment of the condenser output to the cold, low-pressure environment of the evaporator input. It does that by restricting the refrigerant flow in the same way that a water tap restricts water flow when it is turned almost off. In both cases liquid at high pressure exists at the valve input, and liquid at low pressure exists at the output. setpoint, the valve opens wider and allows more refrigerant to flow. When it falls below the setpoint, the valve closes somewhat and allows less to flow. 2. the TXV must be properly adjusted. TXVs are quite reliable devices, are preset at the factory, and do not normally require readjustment. Thus, if the proper evaporator superheat temperature is not being maintained, look first for other problems. Cross section of a typical Thermostatic Expansion Valve (TXV). Numbered items are: Temperature Sensing Bulb; �Thermostatic Head; Diaphragm; �Internal Equalizer; �Temperature Adjustment. The bulb temperature at which the valve opens is determined by the refrigerant pressure at the valve’s output and the force exerted by the internal spring. Changing spring tension changes the temperature of opening. Where cooling (not freezing) is the refrigeration goal, special defrosting equipment and controls may not be needed. Because the refrigerated space temperature is above freezing, allowing the evaporator fans to run when the compressor is off may be all that is needed to remove the frost. Where freezing is the goal, however, heat from some source must be periodically applied to the evaporator coil to melt the accumulated frost. Defrost cycles are often initiated by timers. This is appropriate. But using a timer to establish the duration of the defrost period tends to waste energy. Evaporator temperature is a better indicator of when to stop defrosting. To minimize energy cost, schedule the start of defrosting with a time clock, but let temperature terminate it. Refrigeration systems operate best if the compressor head pressure remains within certain limits. The refrigeration condenser is sometimes situated out of doors and, if the compressor fan continuously blows cold winter air through it, head pressure can drop to well below optimum. One solution is to use head pressure to turn the compressor fan on and off. When head pressure drops below a preset value, a pressure switch turns the fan off. Low-pressure control is also used in some systems to shut the system down in the event of refrigerant loss. High-pressure control is often used in systems with water-cooled condensers to shut the system down in the event of cooling water loss. For further information on energy-related refrigeration issues call Mike Proud or Ron Estabrooks of the Energy and Minerals Section at 368-5010 (toll free). You might want to request the free booklet Energy Efficient Refrigeration Systems.